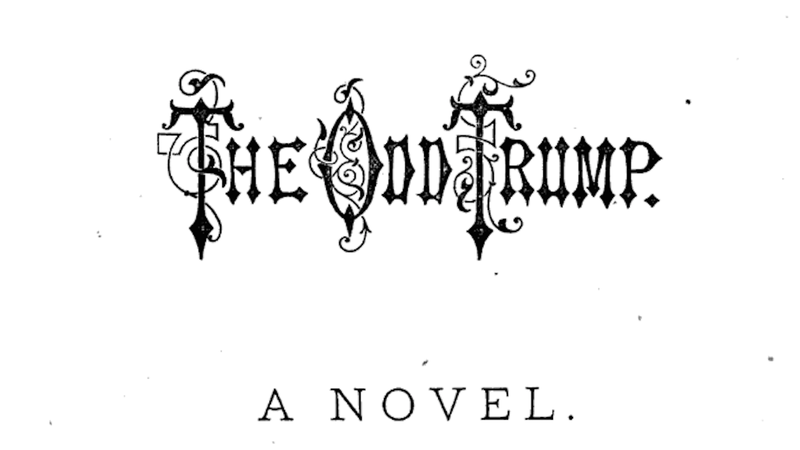 Today in droll coincidences: nearly 150 years ago, an anonymous author published The Odd Trump, a novel whose description leaves no doubt as to the reasons for its obscurity. It’s fanciful and trivial — and it happens to feature a protagonist named Trump with a pal and occasional rival named Clinton. The New Yorker’s Page Turner section published a brief account of the novel, its author, and characters Trumpley Wailes (Trump, for short) and DeWitt Clinton. Trump, appropriately enough, works in a banking firm and obfuscates his financial circumstances. He also rescues a woman from drowning, an act titanically too heroic for Donald J. The Victorians loved a good tale stocked with far-fetched adventures, and this one delivers. The roster of outlandish sundries includes a haunted mansion, “ghostly sleepwalkers,” a train wreck that directly leads to the aforementioned damsel’s near-drowning, and, for good measure, some dueling. It also includes this passage, in which Trump acts a drunken fool and, at Clinton’s suggestion to turn in for the evening, threatens to lob a beer bottle at his head. Throwing beer bottles — now that sounds a bit more accurate. Clinton also refers to Trump as “an obstinate mule-headed sucker,” but unfortunately I don’t foresee Hillary Clinton landing that particular blow. Perhaps we’ll have better luck with “deceitful old humbug”; after all, that’s pretty incontestable. The author who remained anonymous at the time of publication is George J.A. Coulson from Baltimore, Maryland. The Odd Trump was his most successful literary endeavor, but the tepid reviews indicate a mixed response. “We are always grateful to any rising literary man who does not fill us with physical loathing,” wrote The Nation’s reviewer, charitably. Another noted that “the plot is rather complicated.” The chapter titles, a number of which mention dealings with ghosts, suggest as much. They also alert us to a character gloriously named Prince Prettyman. All in all, the novel sounds worlds more pleasant than the 2016 presidential election, and it’s available for your enjoyment! Read it for free here and escape to the wonderful world of Victorian triviality until tomorrow’s debate delivers one and all to a fiery abyss.